Dotty Delightful: Make 2016 your best year yet in life or business! Make 2016 your best year yet in life or business! I joined the academy about 5 weeks ago after quitting my full time job at the council, I wanted to work for myself which I had done in the past but not had lasting success, it kinda peaked and ebbed a lot, well I wanted to do it properly, I want to make my dreams come true, I want to be able to help support my family and help the boys set up for their early adult years without getting a job they hate. I knew I had to get my arse into gear and do it properly, not just be half hearted with it. I wrote a post here about how I discovered what I wanted to do. Through the academy I have got such a supportive of magical women who are there at all different levels of business and life to advise and help. It is truly is amazing what I have achieved in such a short time with Leonie's help and the help of the academy, anyway the whole point of this post is, we are all very excited because an integral part of this is the magical workbook, ta da!! 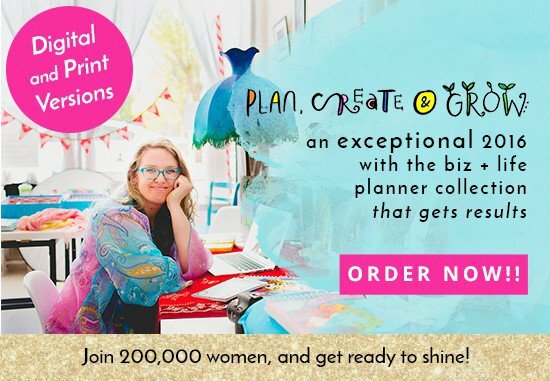 “The 2016 Create Your Shining Year Biz & Life workbooks and brand spankin’ new weekly planner are incredibly popular & useful tools to help you plan out & make happen your most incredible year in life or business (or both!). Over the last seven years, thousands of women have used these goals workbooks with the most amazing results. It’s the best planning tool available to help you make your year your most exceptional yet! Used by entrepreneurs, artists, mamas, creatives, coaches, teachers and women of all ages, the Creating Your Shining Year workbooks + daily planner are filled with powerful worksheets to help you create your amazing new year. Printing out Leonie_Dawson’s 2016 Life + Biz Planner, has you oohing and ahing over every page! Losing friends and don't know why?